In the middle of Madrid’s historic center, his cab off limits, the driver dropped us off just outside a tree-lined, cobbled street. Across it is our hostal. 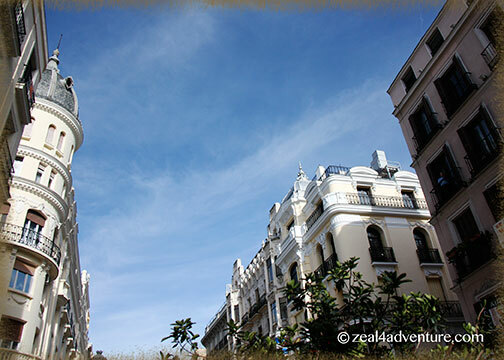 Calle Mayor is filled with buildings of centuries past and within walking distance is Madrid’s main squares, Plaza Mayor, and Puerto del Sol. A good place to be, this part of the city is full of sprightly bars, restaurants, and shops, many of which are old and historical selling traditional goods. Definitely a perfect choice to get into its verve. Madrid didn’t always dazzled. On a day trip en route to Seville some ten years ago, the capital of Spain failed to impress. Too cosmopolitan, my first impression was. 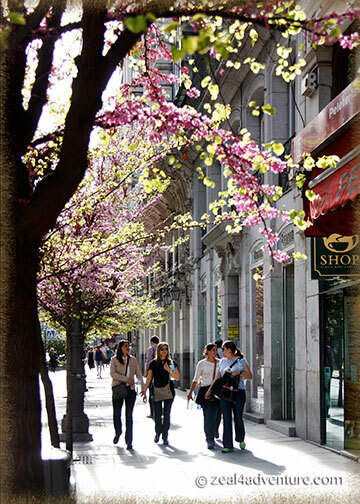 But highly developed as it has become, Madrid’s art, and cultural heritage remains Intact and very much alive. A few days in the capital and I warmed up, I allowed it to dazzle me with its vibrant vibe, the second time around. So how did it change my impression? 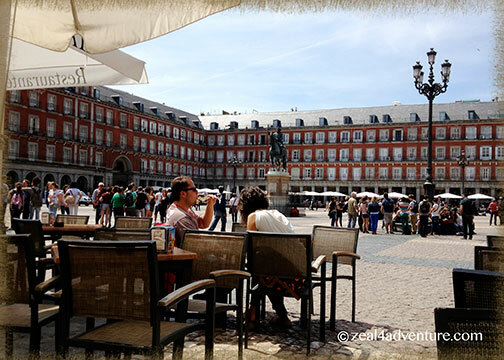 Although overpriced, Plaza Mayor is a marvelous place to while away time. 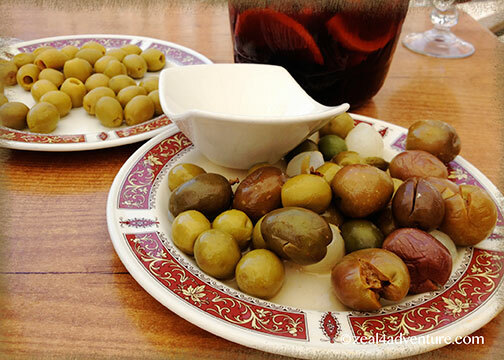 We’d order a jug of sangria, a plate of olives and pass the time and people watch. Built during Philip III’s reign (the Habsburg period), it used to be the center of festivities… bull fights, royal coronations, and executions. 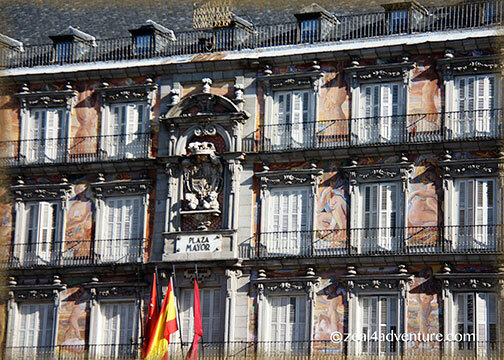 It is still used today for public celebrations and is one of the famous squares of Madrid. It is a beautiful square that measures 129 by 94 meters. Three-storey residential buildings surround it. A fire led to the plaza’s renovation in 1790. 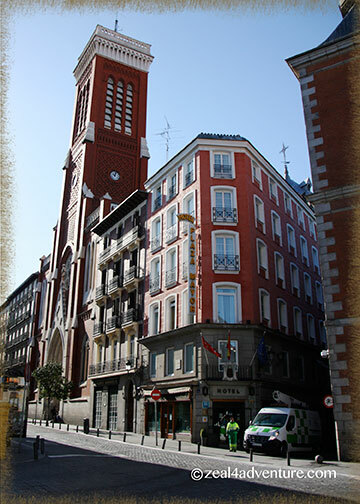 Architect Juan de Villanueva lowered the building fronts and enclosed the square at the corners by building nine archways. The Arco de Cuchilleros with its steep steps leading up to the square is the most arresting among the arches. 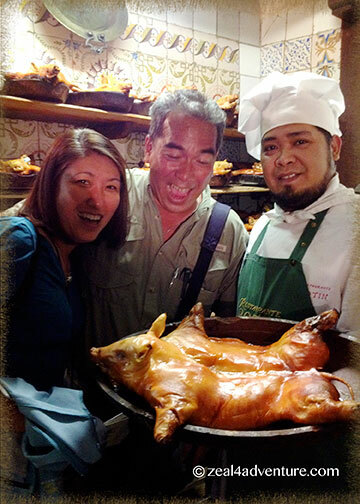 the Cochinillo Asado (roast suckling pig) and Cordero Asado (roast lamb). Superb. 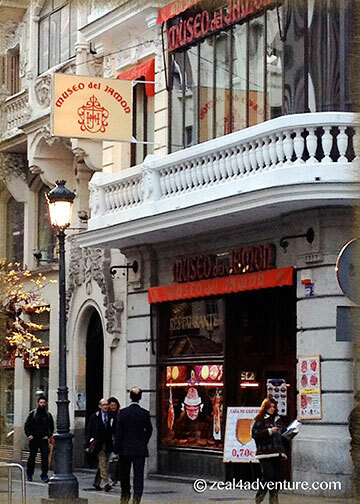 Museo del Jamon (Museum of Ham). Just by the name, you are lured, yes? Legs and legs of ham hang from its walls, calling us from afar. This was the first place, after checking in, we entered. It was jamon heaven and an excellent brunch it made. 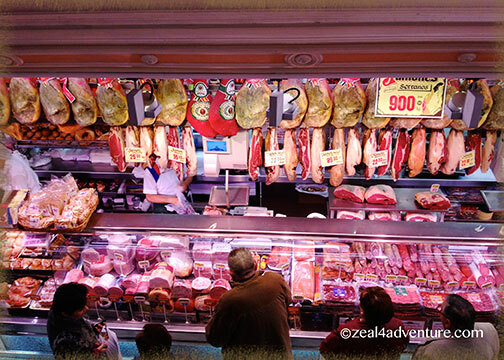 A block away from the hostal, we found it to be a great place to soak in the local scene while sampling different kinds of Spanish ham at very affordable prices. Beer comes with a round of free tapas already. 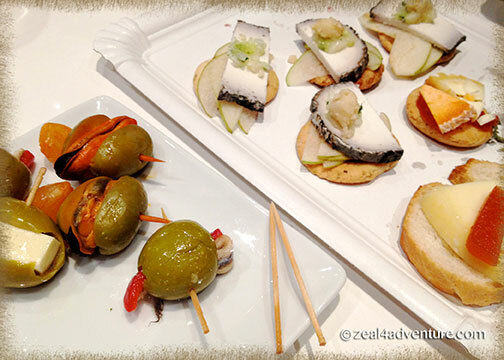 Another excellent venue for very affordable eats is Cerveceria 100 Montaditos. A fun place with many outlets across Spain, actually. A pint of beer and most sandwiches sell for €1. And these aren’t shoddy sandwiches either. How can you go wrong with that? Mercado de San Miguel is my favorite. 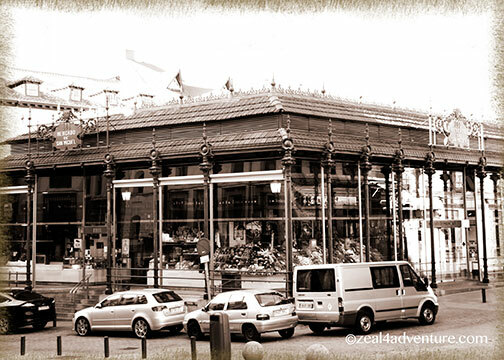 It’s a market and a tapas corner in one roof. Although somewhat of a tourist trap, I was captivated. 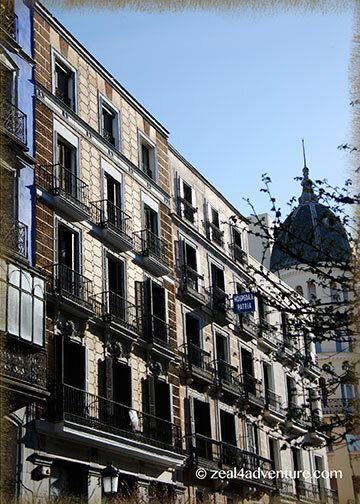 The vibrant atmosphere, the turn of the century building, which was rebuilt when the Belle Époque fell into disrepair, the tapas and various foods are good enough reasons to be trapped here. It is described to be a culinary culture center that brings together the best traders, professionals and experts under one roof and I tend to agree. I truly enjoyed this place. 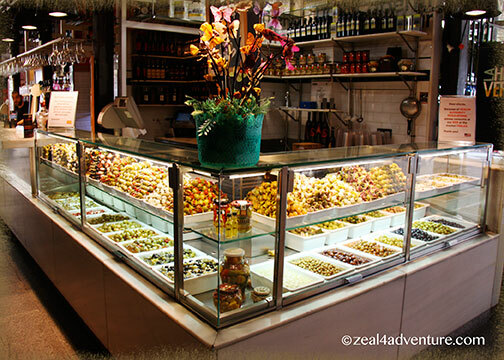 A favorite of the Spaniards, chocolate and churros, they take very seriously. 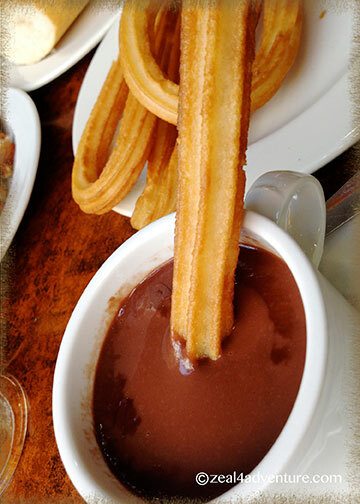 Made of thick dark chocolate, Spanish hot chocolate is almost always paired with churros. The thickness and richness work well as a dip but to drink it after the churros are gone is not a bad thing too. 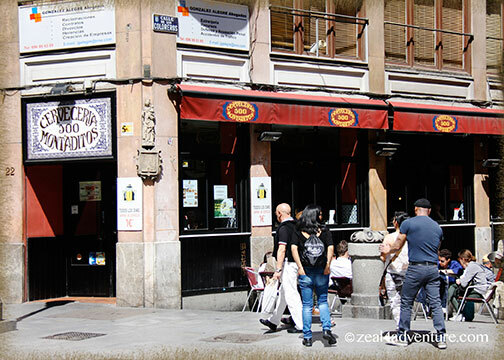 Highly recommended in guidebooks and online searches are San Gines Chocolateria. 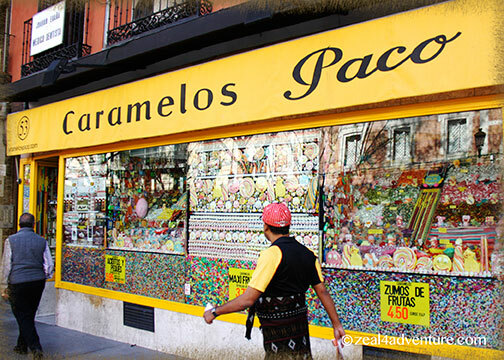 Believed to be the oldest place serving chocolate and churros. We found our way there one morning, a line already forming. The menu, if there even is one, only has a handful of items: café con leche, fresh orange juice, and churros con chocolate caliente. 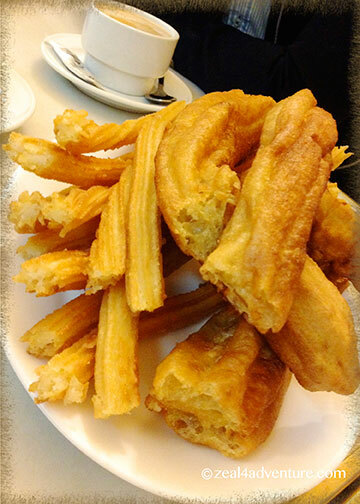 There are 2 versions of the churros – the traditional kind (has 6-7 pieces per order) and the thicker kind called porras. Lighter, I preferred the traditional one. Our hostal host, on the other hand, recommended to Cafeteria Los Pinchitos. It is, to him, the best churros con chocolate in town. 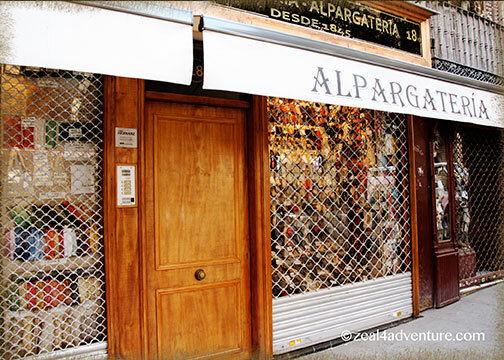 “A secret among Madrileños,” he said. The churros are light, the outside crispy while the inside soft. The chocolate appeals more to my taste – not as thick as San Gines’ but creamier. 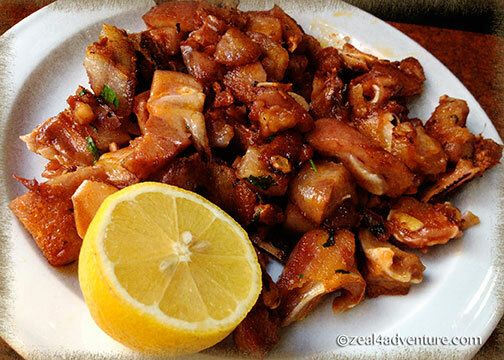 The place lacks ambiance, typically traditional, and the service leaves much to be desired. But the food besides the churros and the chocolate are excellent. 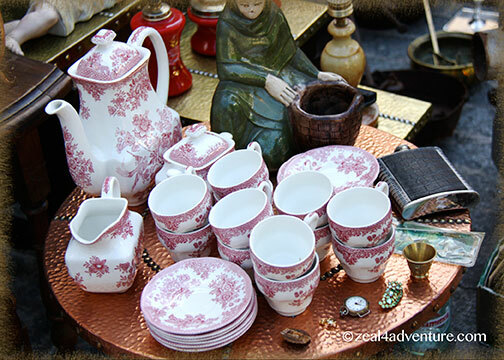 Unless it’s a flea market, a traditional market or a specialty market (for affordable art / conversational pieces that are easy to carry home), I try to avoid the shopping scene. 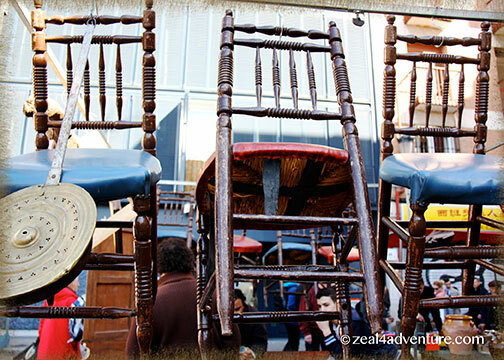 But in Madrid, Sundays should be reserved for the flea market. 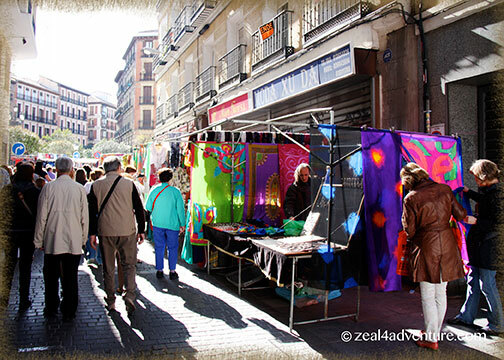 The rastro is a street market from the medieval time. 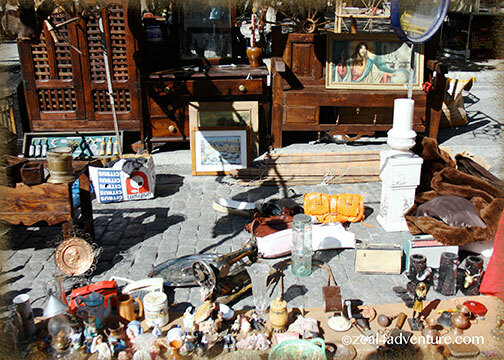 One can spend the whole morning looking at find practically anything, from books and toys, clothes, flowers, handicrafts, to antiques, paintings, and other works of art. 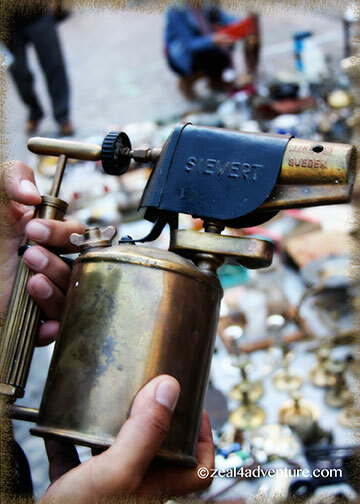 A blowtorch made by Anton’s descendant. How likely is that? 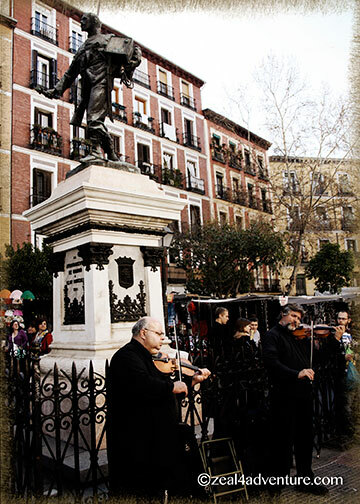 Held every Sunday and public holidays from 9am – 2pm, it takes up a large triangle area between Calle Embajadores and Ronda de Toledo, along Plaza de Cascorro and La Riberia de Curtidones. And suddenly I am charmed. I only had less than 24 hours in Madrid in 2009 and somehow it didn’t impress me either. 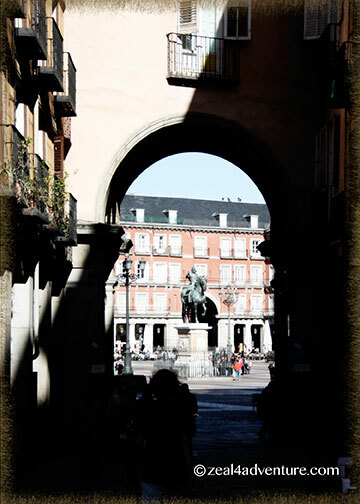 I must go back for a visit, because I enjoyed Plaza Mayor immensely and the architecture was incredible, I thought it warranted a second more thorough visit. Do visit for a few days. There were still a lot that I didn’t get to do.